When it’s time to choose a liquid chug after a long, tough workout, there’s a slew of options out there. Water? Gatorade, POWERade, or All Sport? Endurox R4? 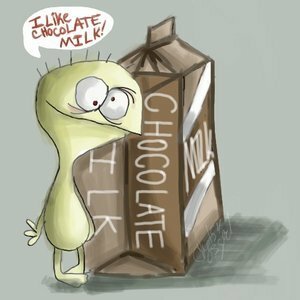 Physiologist Joel Stager, director of the Human Performance laboratory at Indiana University, has even one more potential workout recovery drink to add to the list: chocolate milk. His latest study, published in this month’s International Journal of Sport Nutrition and Exercise Metabolism, names this kids’ favorite an optimal post-exercise recovery aid. Before your stomach recoils, take a look at chocolate milk’s ingredient list. For a high-endurance athlete, Stager’s team sees it as a catch-all workout recovery drink. Compared to plain milk, water, or most sports drinks, it has double the carbohydrate and protein content, perfect for replenishing tired muscles. Its high water content replaces fluids lost as sweat, preventing dehydration. Plus it packs a nutritional bonus of calcium, and includes just a little sodium and sugar — additives that help recovering athletes retain water and regain energy. Stager’s assessment of chocolate milk is even simpler. “It’s water plus a whole lot more,” he said.